Earlier this week, Eco-Justice Collaborative (EJC) and the Protect the Middle Fork Citizens Group joined Prairie Rivers Network, the Environmental Integrity Project, Earthjustice, and the Sierra Club in Springfield as they released “Cap and Run: Toxic Coal Ash Left Behind by Big Polluters Threatens Illinois Water” a new report on groundwater pollution across Illinois due to toxic coal ash left behind by Big Polluters. The report, released Wednesday, found that 22 of the 24 power plants, for which data was available, have contaminated groundwater with unsafe levels of on or more toxic pollutants. The Vermilion Power Station is one of them. The report includes data, from Dynegy and other utilities which show boron, arsenic, sulfate, and other pollutants exceed the legal and safe level. Our day at the State Capitol began with a press event where community members, activists, and members of the press overflowed into the hallway from the packed "Blue Room", where the November 28 press conference was held. 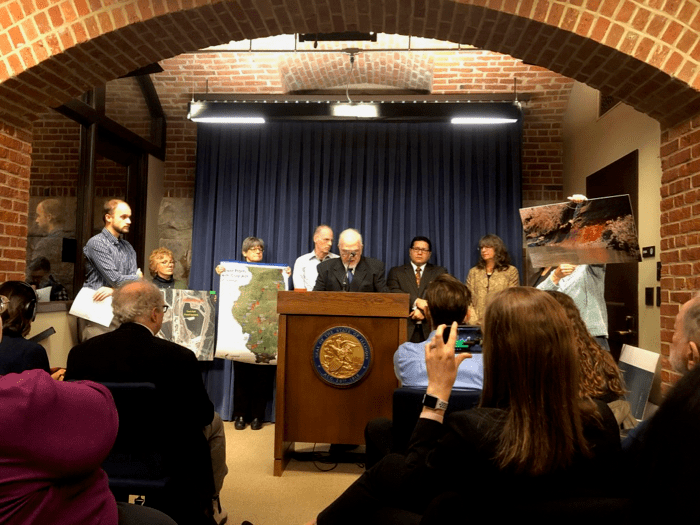 Representatives from Prairie Rivers Network and Earthjustice, along with community members from Alton, Peoria, Waukegan, and Vermilion County, presented the findings of the “Cap and Run” report and shared their stories of how coal ash has impacted their lives and harmed their communities. Taxpayers are not ultimately left "on the hook" for monitoring, maintaining, and repairing coal ash pits and proposed riverbank armoring - or cleanup, in the event of a coal ash spill. Senator Scott Bennet spoke in support of the recommendations in the report, urging his colleagues to address Illinois’ coal ash crisis in 2019. The Middle Fork runs through his District. 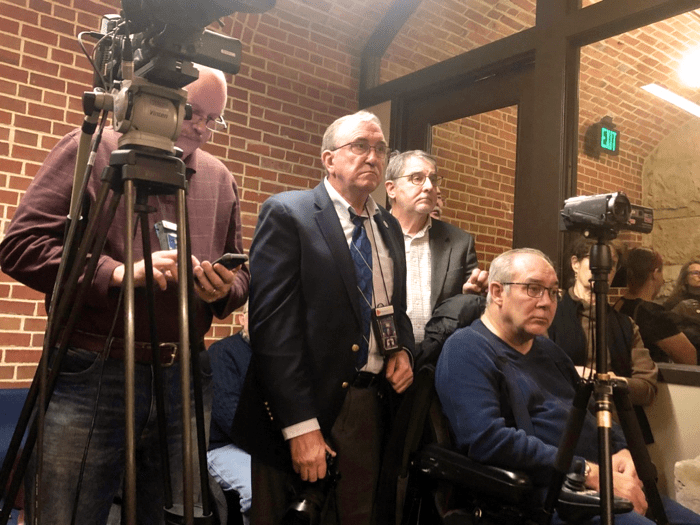 Senator Dave Koehler also was present to show his support, and although Representative Mike Marron could not attend the press conference, he prepared a statement asking the General Assembly to make coal ash regulations a priority next session. After the Press Conference, EJC, along with members of Protect the Middle Fork Group, led a march upstairs to the Governor’s office. Our purpose was to present Governor Rauner with over 2000 letters and petitions calling out the impacts of Dynegy's "cap and run" plan, along with public comments and a transcript from the People’s Hearing EJC held earlier this year. These materials call for full ash removal in order to permanently protect the river and Vermilion County from ongoing pollution and the threat of a coal ash spill. Many of these letters also call on the Illinois EPA and Governor to hold a public hearing on this controversial project. As luck would have it, the Governor himself was in the atrium outside of his office when we arrived. Caught off guard, the Governor refused to talk with us and fled into his office when we tried to deliver the letters and other materials to him. 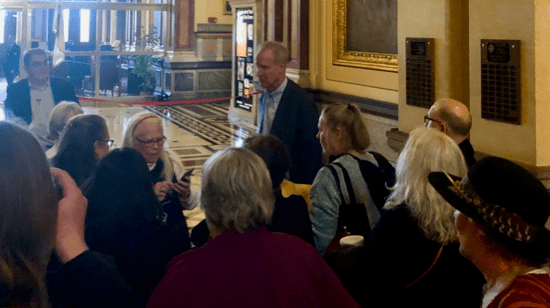 Lan Richart and community members from Protect the Middle Fork followed the Governor into his office to make sure he heard what they had to say, but Governor Rauner still wouldn’t listen! Momentarily rebuffed, the activists re-grouped in the atrium outside of the Governor’s office where Lan spoke for the gathered press and community members about the importance and urgency of cleaning up the toxic legacy of coal ash that has been left where it can contaminate Illinois’ ground and surface water sources, the importance of public participation, and the urgent need to remove coal ash from the banks of the Vermilion and place it far from the river. Once we’d re-grouped, a second effort was made to deliver the transcripts and letters to the Governor and this time it was a success! The Governor still wouldn’t meet with us, but all materials were delivered to one of his chief aides who promised Governor Rauner would see them. 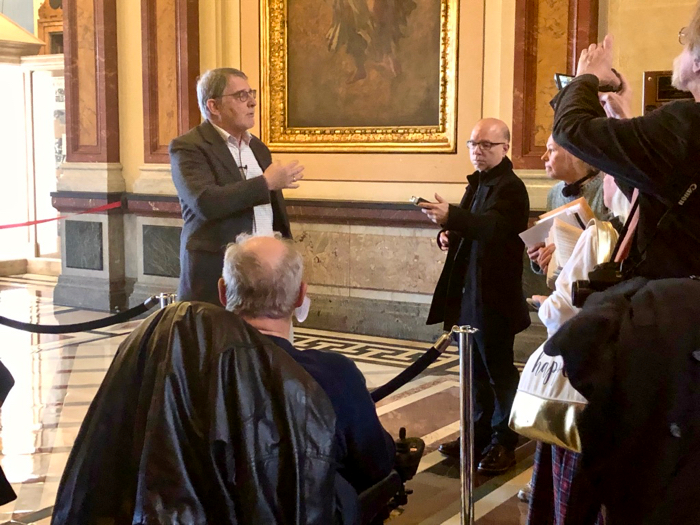 Having successfully done what we had come to do, we left the State Capitol Building and went to the offices of the Illinois Environmental Council who had graciously offered to host us as well as our partners from around the state. Sierra Club provided lunch, as we celebrated and refueled. Today’s success was a result of the tireless support of people like you. It’s time that we ask our senators and state legislators to take coal ash seriously by providing permanent protection, guaranteeing communities have a voice in how coal ash pits are closed, and ensuring polluters are the ones paying to clean up their mess. Take Time to Help Protect the Middle Fork! Sign this letter asking the Illinois EPA to hold a hearing on Dynegy's "cap and run" plan. Sign this letter to the U.S. Army Corps of Engineers, asking them to hold a hearing on Dynegy's riverbank armoring plan that will harm the Middle Fork, one of the most biologically diverse rivers in the Midwest. Sign this petition, calling on the General Assembly to address Illinois' coal ash crisis. Speak Up for Illinois Water!